"Like, one of my best friends ever", says the Boondock Saints actor of the Love Actually alum who this weekend will be departing TWD one way or another after nine seasons as the Georgia sheriff's deputy. The British actor starred in his very last episode of the post-apocalyptic horror series on Sunday night, and now he will continue his character's story in a trilogy of feature-length projects written by The Walking Dead's chief content officer Scott Gimple. 'The story of Rick will go on in films, ' Gimple says. A series of AMC Studios Original Films, starring Andrew Lincoln and written by Gimple, are planned to continue the story of Rick Grimes, with the first expected to begin production as early as 2019. WARNING! Do not proceed if you haven't watched Sunday's episode of The Walking Dead! Some of the stories will relate to The Walking Dead as fans know it while others will be standalone stories that break into new creative territory. 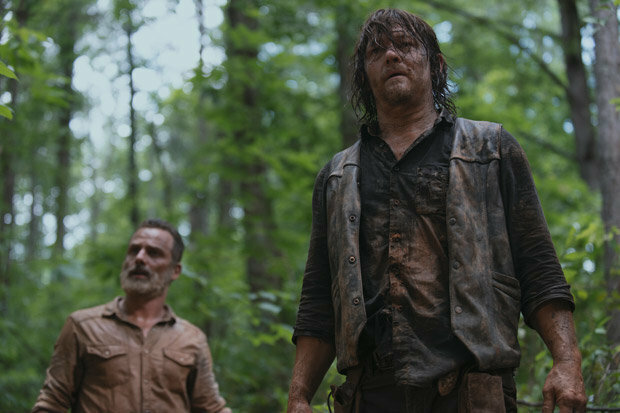 Tonight's episode of The Walking Dead was touted as the last for Andrew Lincoln's Rick Grimes, but fans expecting the character to be killed off were thrown for a loop. So, that leaves the door open to continue his story and sure enough, that's what AMC's chose to do, with the network announcing that they're working on a series of AMC Studios Original Films, with the first one going into production next year. "We want to break new ground with different, distinct stories, all part of the same world that's captured our imagination for almost a decade of the Dead". "It's not the beginning of the end, it's the end of the beginning". Sure, it makes you a coward, but we won't tell anybody. "There is something exciting about moving toward an end game for Rick's story that appealed to me". "Maybe it's the start of a bigger story".